our orders were to sleep in on sunday, as we had nowhere to be and really not a thing to do. i stirred this morning around nine thirty to wafts of freshly cooked bacon that had wound up the stairs and into my room. i freshened up and bounced downstairs to greet mark and kathleen good morning. the day wasn’t too hot yet, so we munched on our breakfasts on the patio. the breeze gladly met us out there, providing for a very pleasant meal. soon enough mark was up and at ’em, getting his weekend chores knocked out left and right. kathleen and i proceeded to stay put in our porch recliners for the next couple of hours, talking about everything under the sun. we needed refills on coffee and tea, so we simply moved our conversation to the comfy leather sofas in the family room. if you ever need company on a lazy sunday afternoon, you now know two well-suited ladies. i got my things repacked for the upcoming week, and we then hopped in the highlander to make one last stop together for dinner. kathleen’s eye had been caught by mattito’s near the mall a couple times, so tex-mex it was! there are several mattito’s locations around the frisco and dallas areas, so you’ll be sure to find one near you. mattito’s is bright and energetic, and i was glad to be having dinner in a relaxed atmosphere. the wait staff was quite friendly and attentive throughout our meal, quickly taking our drink orders and dropping off chips and salsa at the table. mark took a swift look over the menu, deciding very soon what he wanted: the chicken fried steak. yes, you heard me correctly. 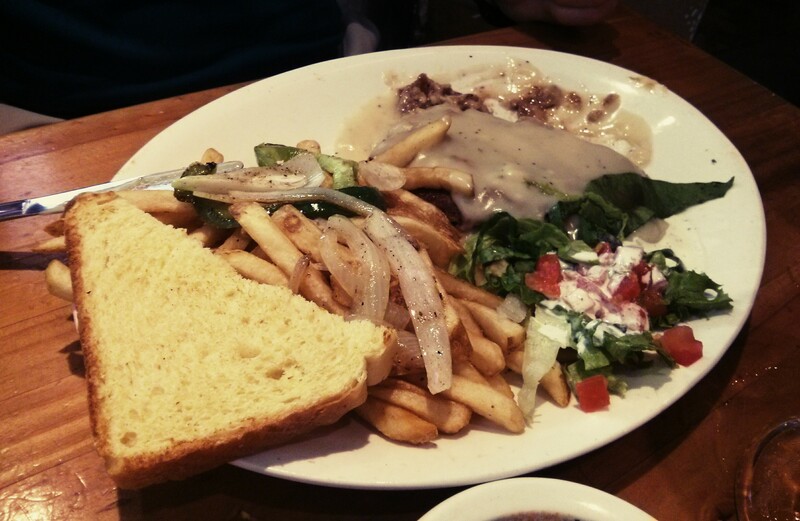 chicken fried steak at a tex-mex spot. it even says on the menu that it sounds crazy! the dish arrived, and i was curious to see if he even liked it. not too many minutes later the plate was nearly clean, not a morsel of chicken fried steak to be seen. to the surprise of us all, he said it was quite delicious and that he would order it again. unfortunately, though, kathleen did not enjoy her dinner nearly as much as mark. nothing on the menu was really catching her eye, so she ordered a couple of beef enchiladas a la carte with rice. 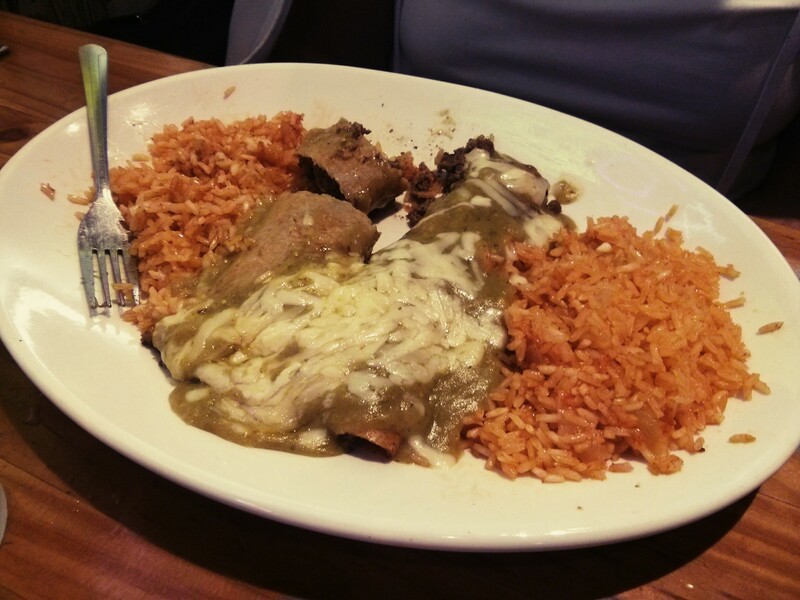 i don’t know if the waiter misheard her, but the enchiladas were smothered in tomatillo sauce when she had wanted them topped with a traditional red. bummer, right? she picked about halfway through the first enchilada and realized she just didn’t have an appetite for tex-mex that night. since the chips and salsa had filled her pretty well, she wasn’t too distraught about not wanting to finish her meal. i guess that just happens sometimes. i, like mark, really did care for my dinner. 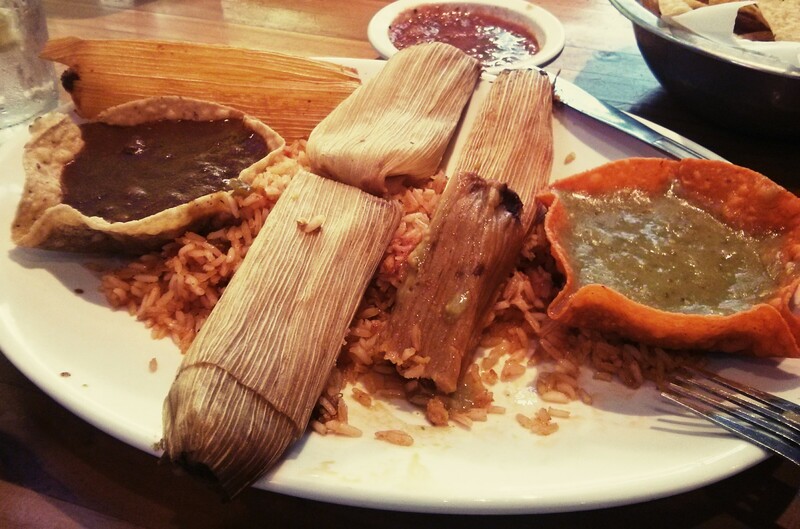 i was craving tamales, and they just so happened to have them on the menu. yay! i ordered the two chicken and two beef tamales, and it was the perfect amount of food. i didn’t get to finish all the rice, but that’s only because i didn’t want the good stuff to go to waste. the tamales were served with tortilla shells full of tomatillo sauce and chili con carne sauce. both were tasty complements to the tamales, which had the most wonderful masa surrounding the fillings. i’m not sure if mark and kathleen will find themselves back here again, but i would certainly say it is worth a try. after dinner we made the short drive to downtown to get me checked in and settled for the coming week. good weekends sometimes seem to go by too quickly, and this one was no exception. it was just so wonderful to explore and spend time with mark and kathleen, and my fingers are crossed that it won’t be too long before i’m back out here for another adventure.